A rare find in kitchen décor options, MR Direct’s newest apron designs offer tropical mystique. 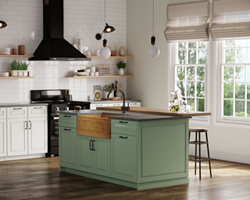 In some sectors, the interest in apron, or farmhouse, style sinks is beginning to rival levels seen during the mid-20th century, when they first debuted. Today, these sinks may not always be in the traditional form of ceramic over cast iron; but instead, in any number of contemporary metals or composites. MR Direct has decided to fuel this home decorating trend by introducing two new apron styles. The difference is that these sinks are constructed from a material rarely found in the kitchen sink market – bamboo. Both new sink models are designed in a single basin format with identical features; but one is approximately 10% smaller than the other, to better fit limited-space kitchens. The drains are centerset. Beyond the inherent appeal of a particular sink material; it is the bold, jutting, facade of any apron sink that garners the most attention. Some are utterly smooth and unembellished; while others feature a decorative, even ornate, face. The new MR Direct bamboo sinks have a simple and elegant, rectangular pattern embossed across their façade. The contemporary, yet exotic, character of these sinks is further enhanced by their gently rounded corners. These curves are distinguished by a repeating pattern of small, bamboo blocks in a wide range of amber colorings. They stand in delightful contrast to the long, even-toned, horizontal rows of bamboo that form the four sides and base of these expansive sinks. Bamboo is a very eco-friendly material. It grows quickly and needs little care. It can be harvested in just a few years, and is easily renewed. It is being used in a number of commercial products because of its inherent strength and water resistance. In the construction of these apron sinks, strips of bamboo are lined up, glued, and pressed together for an extremely tight bond. Successive layers of secured strips are fixed upon the previous layers, creating interesting and divergent patterns. After a final sanding, and sealing with a premium varnish; these basins are ready for years of care-free service in the kitchen. Maintenance is simple. Only mild soap and water is required. Any harsh chemicals or abrasive scrubs should be avoided. An annual application of a polyurethane wood sealer will insure the utmost protection.